Ten Year mural rejuvenation, Sheps Riverlodge Lismore. Canvas commissioned for private collector Brisbane. Administration mural and signage, Shailer Park State School. Be Wise mural, Brisbane Bayside State College. Spy Vs Spy mural with Kosie 1 at Byron Bay Sports and Cultural Complex. Stencil art workshops Anglicare Central Queensland, Barcaldine. Mural for Tourism Centre, Barcaldine. Mural commission, Edge Hill Cairns. Photography backdrop mural, Studio Star Pghotography, Surfers Paradise. Artist in Residence for Arts Fest workshops and mural, Calvary Christian College Carbrook campus. Madison on High Street public art commission, Southport. Redland Museum Printery display mural. Workshops to copmplete community mural Lismore (Funded by Arts Northern Rivers). Art demonstrations Love Lennox Festival (Funded by FSG). Steaming On mural Grandchester State School. Various murals during Sydney Spraycation. Workshops and mural Brisbane Bayside State College. Mural for North Coast TAFE (Funded by FSG). No projects this month (1st time in 15 years of business). Signage for Shailer Park SHS. PBL Mural Robina State School. The Birthday Bash with Kosie & Greasy at Toombul. Convergence solo exhibition at Grassland Art Gallery, Tambo. Wilderness Way Community Project workshops and mural, Tambo. Under The Sea mural at private residence, Brisbane. Signage for Shailer Park State School. World Map floor mural at Emmanuel College, Gold Coast. Mural at St Lukes, Capalaba. Capalaba join up with Kosie 1. Commission for private collector, Chinderah. Mural at Crabbes Creek Public School. Designs for Grit Scooter Company. Ipswich West State School mural. Shop mural Kick Push, Tweed Heads. Arts Fest workshops at Calvary Christian College. Signage for Upper Mt Gravatt Kindergarten. Sketch Swap with SG1 from Adelaide. Tuckshop mural Arundel State School, Gold Coast. Youth Space mural, YMCA Northlakes. Classroom Graphics Shailer Park State School, Brisbane. Van mural for Wesley Mission Brisbane. Designs and warehouse mural for Kick Push, Tweed Heads. Values mural Thornlands State School, Redland City. Hutcho’s Wall Annual Jam production with Skonda, Kosie 1, Wolf and Ksino Murwillumbah. Signage at Mt Cotton State School, Redlands. Murals, demonstrations and workshops for The Blackall Show, Central Queensland. Stencil Art Workshops Blackall & Tambo (Funded by Blackall Tambo Regional Council). Murals and signage at the Sandstone Point Hotel. Mural at Innocent Ink, Tweed Heads. Mega X mural, Xtreme Trampoline, Meadowbrook. Market stall signage for Chozen Riders Company, Murwillumbah. Anzac mural Redlands RSL, Cleveland. Stencil Art workshop, Inala PCYC. Youth Week mural project, Longreach (Funded by Longreach Regional Council). Park Fest & PCYC Youth Management Team murals Dalby, Western Downs. Human Performance Centre mural, Gold Coast. Rainforest Room mural, Mt Cotton State School, Redlands. Join up with Inks, Byron Bay. Signage at Southside Carsales, Slacks Creek. Mural with Scon at Trade Inn Motors, Slacks Creek. Wedding photography backdrop mural with Kosie 1, Byron Bay. The annual Birthday Bash featuring Kosie 1, Rems, Deks and Scon at Nerang, Gold Coast. Cedar Cutter mural, Redlands Museum, Brisbane. Noticeboard mural Cabarita (Funded by Caba Creative) Cabarita Beach. Logo design Tweed Heads Carsales. Australia Day mural, Private residence, Birkdale, Redland City. Five Letters retrospective solo exhibition, The Sauce Studio, Murwillumbah. Technology block mural, Emmanuel College Gold Coast. Youth Arts Project, Anglicare Emerald & Blackwater. Mural at Chinchilla Western Downs Queensland. XIXLXIX mural, Mount Gravatt State School, Brisbane. Captain Green mural, Windaroo Valley SHS. Banner for Byron and Beyond, Byron Bay. Workshops with Anglicare CQ, Emerald. The Studio classroom mural, Crystal Creek Public School, Tweed Valley. Stencil art workshops, Moreton Bay Boys College. Mural at private residence, Capalaba, Redland City. ROC Race mural, Upper Mount Gravatt State school, Brisbane. Dance room mural, Loganlea SHS. Additional signage at Upper Mount Gravatt State School, Brisbane. Rise Above mural, Byron Bay Regional Sports & Cultural Complex. Artist in Residence at Calvary Christian College for Arts Fest Week. Mural collaboration with Kosie 1 at Moorooka. Mural collaboration with Mr Wolf, Murwillumbah. Stencil art workshop, Blackwater SHS. Kalob canvass commissioned by private collector, Emerald. Artist in Residence at Coalstoun Lakes State School. Hit Wall mural project, Emerald. (Funded by Anglicare Central Queensland). Aerosol Art demonstration at Relay For Life, Emerald. Art in the Park mural, Emerald. Workshops in Blackwater and Emerald Central Highlands Multicultural Festival. (Funded by Arizon). Two bedroom murals, private residence, Emerald. Kids pool and entrance murals, Emerald Aquatic Centre. (Funded by Bobtrac). Signage for Upper Mount Gravatt State School, Brisbane. The Buddah and the Dragon mural, private residence, Mount Gravatt. Barcaldine mural. (Funded by Barcaldine Regional Council). Canvasses commissioned for private collector, Barcaldine. Cactus Garden mural, private residence, Barcaldine. Signage for Chozen Riders Company, Murwillumbah. Working Together mural, Upper Mount Gravatt State School, Brisbane. Stencil Art workshops at The Sauce Studio, Murwillumbah. Stencil Art workshops, Anglicare Central Queensland, Emerald. Anglicare 30 years celebration mural and demonstrations. Demonstrations at the Capella & Emerald Shows. Ski Boat and vehicle murals, Emerald. Prep mural Shailer Park State School, Logan. Increase The Peace 48m long mural collaboration with JaeTheArtist, Skonz and Ksino, Murwillumbah. Grand View Hotel display backdrop mural, Redland Museum. Stencil Art Workshop, The Sauce Studio, Murwillumbah. Cultural mural, Upper Mount Gravatt State School, Brisbane. Three Sixty Five 1st birthday celebration and solo exhibition at The Sauce Studio, Murwillumbah. Rrreception mural, Shailer Park State School. WALT murals, Wynnum West State School. The Cool School Koala Cafe sign and mural, Coolnwynpin State School, Capalaba. Completed Still Lifeless, A&C 3D, Overcast Enlightenment and The Guide fine artworks. Budd Park frog mural, Murwillumbah. Elevation piece, Upper Mount Gravatt. Cafe Ten One Twenty mural, Cairns. Evadable Exhibition, Ground Control Coffee South Tweed. Happy Herb Company warehouse mural, Uki. Stencil Art workshops, The Sauce Studio, Murwillumbah. Stencil Art workshops, Redlands College Wellington Point. Unleash The Beast mural, Iona College, Brisbane. Strawberry Fields mural, Redlands Museum, Cleveland. Birthday Bash 2014 with Kosie 1, Capalaba. Kickwall mural, Byron Bay Regional Sports and Cultural Complex. Stencil Art workshop, The Sauce Studio Murwillumbah. Back in Black private fence mural, Birkdale. Steampunk Mural, Ground Control Coffee Tweed Heads South. Sign and footpath stencils, Shailer Park State School. Sports mural, Tambourine Mountain State School. Outdoor training area mural, The Gym Murwillumbah. Completed Green Tree Frog and Simple Things fine art pieces. Sports Shed mural, Calvary Christian College, Carbrook Campus. Live Aerosol Art and market at RAW Encompass at The Beach Hotel, Byron Bay. Cultural Arts mural, Tambourine Mountain State School. IMPACTS Mural, Upper Mount Gravatt State School. DUKES Mural and workshops, Inala PCYC. Access Centre and Music murals at Benowa State Primary. Artist in Residence, Calvary Christian College, Carbrook Campus. Murals and signage at Tadpoles Eatons Hill. Stencil Art workshops at Moreton Bay Boys College, Manly. Stall at Brisbane Alternative Expo, Morningside. Participant in Eight Namer graffiti mural, Capalaba. Cafe and Welcome murals, Springsure State School. Workshop to complete Stingers mural, Springsure Pool Complex. Workshops to complete Values mural, Blackwater State High School. Two murals at Emerald BMX facility. Workshops to complete Emerald Neighborhood Centre mural. Stains of Modernity showcase, The Sauce Studio, Murwillumbah. Completed Studio Buddha mural, Murwillumbah. Completed mural and signage at Ink Addict Tattoo, Tara. Carried out Aerosol Art demonstration Central Highlands Multicultural Festival, Emerald Showgrounds. Community mural on garden sheds and Floor mural, Anglicare Central Queensland, Emerald. Stencil art workshops and Anzac mural Capella State High School. Stencil art workshops, Emerald and Rubyvale. Aerosoul and Roots fine artworks sold to a private collector, Murwillumbah. Burringbar Gardens Nursery markets banner. Mural and planter boxes artwork at Shailer Park State School. Judge and sponsor at Kedron Park Hotel Breast Cancer Fundraiser Graffiti Competition. Two canvasses donated to Murwillumbah State Primary fundraising event. Canvas donated to Crystal Creek State School Fireworks Spectacular fundraising event. Happy Campers caravan mural, Evans Head. Nice Nails fine artwork commissioned by private collector. Completed Tweed River View fine artwork. Values mural at Wynnum West State School. Completed City Girl mural at Coolnwynpin State School. Contributed to Home is Where the Art is Album cover artwork for Nuggy G.
Completed In The Jungle fine artwork. Fine Art used in filming of CAMP series for Matchbox Productions. Finalist International Mural Fest, Sheffield Tasmania. It’s Cool to go to School mural, Tamborine Mountain State School. Stencil art workshops Springsure State School, Springsure skatepark, Capella State High and Anglicare Emerald (Funded by Anglicare CQ). Skatepark mural art project, Julia Creek (Funded by McKinlay Shire Council). Opening of The Sauce Studio, Murwillumbah. In-house Signage, promotion, murals, clothing and merchandise designs. Lets Play Together mural, Shailer Park State School. Extension of Welcome mural, Service South State School. Breaka Burleigh Pro Aerosol art demonstration. ABC Gold Coast radio interview. In-house Postcard, Clothing and merchandise designs. A-Town join up, Alexandra Hills. “Ney Road Mural” Coolnwynpin State School. New Years day paint, Nerang. Brisbane Pop Culture Shopfront mural, Newstead. Completion of various fine artworks. Sports House mural, Robina State School. Bee mural, Mt Gravatt State School. This is as Christmas as I get, Capalaba. Worongary Wave, with Romz & Skone. Values mural, Tamborine Mountain State School. Caldera Panorama Mural contributor, Murwillumbah NSW. Mural at Redbank Plains State School. Stencil Art workshop, Bayside PCYC Lota. Monsters in my house Resene Mural Masterpieces Entry, Mt Gravatt State School. Friend or Foe? Border Art Prize finalist, Tweed River Art Gallery, Murwillumbah. From the Underground and Dry Season fine artworks in BARI Exhibition, Jugglers art space Fortitude Valley. Artist in Residence for Arts Fest Week, Calvary Christian College Carbrook. 2 stencil art workshops, Logan Art Gallery. Welcome mural Portside Wharf, Hamilton Brisbane. Graff Art collaboration with Mr Fires, Jugglers Artspace, Fortitude Valley. Grandstand mural, Birkdale Breakers Swim Club. Vehicle artwork, Eagleby Youth Space. 2 mural workshops at EPIC Employment, Get Set For Work program, Caboolture. Finalist in Caldera Art Prize & Exhibition Murwillumbah Civic Centre with fine artwork Emerging Technologies. Stencil Art workshops, Moreton Bay Boy’s College. Illumunate piece and signage at Green Leaf Cafe, Morningside. Aftermath mural Jamestown Mural Fest, South Australia. 2 week Central Queensland Schools Tour. Murals and workshops at Barcaldine State School, St Joseph’s Catholic Primary Barcaldine, Muttaburra State School, Aramac State School, Jericho State School and Alpha State School. 5 day project Lifeline and Anglicare Central Queensland Momentum Camp (Funded by Rio Tinto). Sunset canvas sold to private collector, Jericho. Stencil Art workshop at EPIC Employment, Get Set For Work program, Caboolture. Outside Inn Exhibition at Jugglers Artspace, Fortitude Valley. Artworks published in Clouded Thoughts Magazine #12. Birkdale Breakers Swim Club mural, Birkdale State School. Undercover area mural, Birkdale South State School (Funded by Birkdale South Safety House Committee). 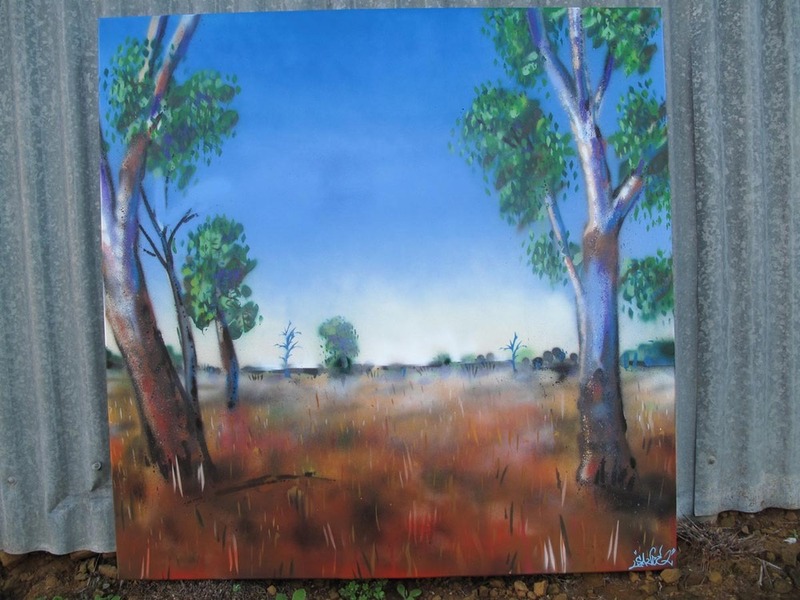 Dam Vandals and The Return fine artworks exhibited at Barcaldine Art Show. Eagleby Youth Space Fence Mural Project (Funded by Wesley Mission). Caldera Panorama mural contributor at the Caldera Art Gallery, Murwillumbah. Aftermath Miniature, Jamestown Mural Festival. Undercover Area mural, Redbank Plains State School. Mural workshops, Brisbane Bayside State College. Attack of the quad-copters mural, private fence Birkdale. Beat Da Box Stencil art workshops, Mt Gravatt PCYC. Keepin it simple pieces at Jugglers Artspace, Fortitude Valley. 3 Stencil Art workshops Camp Quality Senior Siblings Winter camp, Currimundi. 2 Arts workshop to complete mural at EPIC Employment, Get Set For Work program, Caboolture. Fuel Stop mural, Richlands East State School. The Brewing Process mural, The Beach Bar and Grill, Mooloolaba. Youth Week stencil art workshops, INSYNC Cleveland. Arts workshop EPIC Employment, Get Set For Work program, Caboolture. Ravenous Machine mural, finalist Tazmazia International Mural Fest, Sheffield Tasmania. Sign for INSYNC Youth Service, Beenleigh. Hip Hop Garage mural, private residence Gold Coast. Emerging Technologies fine art work. In Full 3-D mural, Bay Central Storage Wynnum. Logo design INSYNC Youth Service. 4 murals, Bambini ECD Caloundra. Undercover area & Toilet Block murals, Birkdale State School. “52 on Vulture” murals, Cowlishaw & Son West End. Burringbar Botanic Gardens Nursery trailer. “Community Spirit” murals, Serviceton South State School. Demonstration and class talks at Redlands College, Wellington Point. “Ravenous Machine” miniature, finalist Sheffield International Mural Fest. Workshop, Young Carers Project, Sunnybank Hills. Four stencil art workshops, Caddies Youth Support Jimboomba. “Memorial Garden” mural, Coolnwynpin State School, Capalaba. “It’s All a Blur” miniature, contribution to group mural to celebrate 25 years of murals in Sheffield, Tasmania. .
Mural at Farmers Choice Organics, Murwillumbah. Fairwell “Mr Smith Canvas”, Blackall State School. “The Hub” mural, Coolwynpin State School, Capalaba. “Values” mural, Woodcrest College Junior Campus. “Carole Park Cats” mural, Carole Park State School. “Seniors 2011” mural, Moreton Bay Boys’ College. “Possum’s Paradise” mural, Serviceton South State School. 5 day Artist In Residence project to complete murals and workshops Arts Fest Week, Calvary Christian College Carbrook. Guest speaker “Artwaves” Logan and Adjacent Areas Secondary Schools Art Exhibition, Logan Art Gallery. 2 Murals at Bambini Early Childhood Development, Coombabah. “Final Glow” & “Cabarita” Caldera Artfest Exhibition, Murwillumbah Civic Centre. “Final Glow” Caldera Artfest O’Riellys Exhibition. “In Control” mural, Richlands East State School. “Lorikeets” mural, Serviceton South State School. 3 workshops to complete cultural mural with Richlands East State School Indigenous Student Council. “Stairwell Dragon” mural, Durack State School. 11 day project to complete murals and workshops at Emerald skatepark, PCYC, Community Solutions, Anglicare fence mural and Disability Action Week promotional banners (Funded by Anglicare Central Queensland). 2 Aerosol Art Workshops “Off The Wall” project, Burpengary (Funded by Burpengary Baptist Church and Moreton Bay Regional Council). “Garage” mural Goodstart Childcare, Eight Mile Plains. “Childs Play” mural Bambini Early Childhood Development, Capalaba. INSYNC staff team building aerosol art workshop, Cleveland. “Bush Sauce” piece, Tweed Valley. Get Set For Work aerosol art workshops to complete classroom mural EPIC Employment Inc, Caboolture. Memorial mural, Mount Cotton State School. 3 Aerosol Art Workshops “Off The Wall” project, Burpengary (Funded by Burpengary Baptist Church and Moreton Bay Regional Council). Completed “Final Glow” fine art work. “We’re Wynnum We’re Proud” mural, Wynnum State High School. 2 aerosol art workshops “Artsporations” project (Funded by IN-SYNC). 2 Workshops Camp Quality Senior Camp, Currimundi. Workshops to complete 2 murals, Murphy’s Creek (Urban Art Project Funded by Lockyer Valley Regional Council and RADF). Aerosol Art Demonstration, Riverview Scooter Competition (supported by Goodna Youth Service, funded by Ipswich City Council). New piece, Planet Matterz, Morningside. Fine artworks “Sunrise Somewhere”, “The Rainbow of Lower Crackpot” and “The Caldera” in 18th Annual Barcaldine Art Exhibition. 35 metre “Great Outdoors” mural at Goodstart Childcare, Murarrie. “Frog Garden” mural at Cerebral Palsy League, Capalaba. “Momentum” mural project, Emerald (Funded by Anglicare Central Queensland). Aerosol art workshops at Caddies Youth Support, Jimboomba. 2 “Artsporations” aerosol art workshops Boystown Get Set For Work Capalaba (Funded by IN-SYNC). Workshops to complete 2 murals, Withcott (Urban Art Project Funded by Lockyer Valley Regional Council and RADF). 5 day mural art project Blackall, Central Queensland (funded by PCAP). 5 day canvas art and mural project St Joseph’s Catholic Barcaldine and Barcaldine State School (funded by PCAP). “Dry Season” and “From the Underground” fine artworks, Blackall Heartland Festival exhibition. Winner Sheffield International Mural Festival, Tasmania. 2 aerosol art workshops Artsporations. Aerosol art workshop ALARA, Laidley. Big Day In Youth Fest, Gatton (funded by Lockyer Valley Regional Council). Art demonstration, Springfield Youth Week skate competition. 5 day canvas art and mural project, Nananango State High School. Completed “Dam Vandals” fine artpiece. Harmony mural and art workshops, Redbank State School. Dinner Time mural private residence, Wakerly. Backdrop piece at Starshots, Surfers Paradise. 3 murals at GCITChildren’s Centre Ashmore. Canvas painting workshops at Caddies Youth Support, Jimboomba. Workshops to complete murals at Ipswich Community Youth Service. “Pig Pen” mural at Bush Kidz, Blacksoil. 50m long Richlands Underpass mural (Funded by Horizon Alliance). 50m long “Bush Animal” mural, Tadpoles Early learning Centre Eatons Hill. 3 workshops and “Big Bang” mural at the Queensland Academy for Mathematics, Science and Technology. Completion of Bicycle locker murals, Richlands (Funded by John Holland). 10 workshops “Urban Art” project, Forest Hill, Gatton, Grantham, Laidley & Kengsington Grove (Funded by RADF & Supported by Lockyer Valley Regional Council). Mural & signage Tadpoles Early learning Centre, Eatons Hill. Artist in Residence, Calvary Christian College’s “Arts Fest” week (funded by AIR). Completion of 88m long “Night & Day” Respite Shelter mural Horizon Alliance, Richlands (Funded by John Holland). 2 workshops to begin “Urban Art” project, Helidon (Funded by RADF & Supported by Lockyer Valley Regional Council). “Wet Day” mural collaboration with Kosie, Redlands. Canvas demonstration at “Starry Starry night in Neon”, Cantebury College Waterford. 1 week project to complete several murals and canvasses , Blackall State School & St Joseph’s, Blackall (Funded by PCAP). 2 week project to complete murals and facilitate workshops at Winton State School. Begin Respite Shelter mural Horizon Alliance, Richlands (Funded by John Holland). “flavor” scooter product designs for Rolling Distribution. “Hall Dragons” and sports oval murals, Durack State School. 70m long “Sport & Rec” mural & 4 workshops Horizon Alliance, Richlands (Funded by John Holland). 90m long “Local Area History” Richlands Station Wall mural. “Youth Fest” workshops and demonstrations at the Cloncurry Show (Funded by BHP Billiton and supported by Cloncurry Show Society, PCYC & Bugg & )x Café). Guest presentation to senior Voc Ed students, Redlands College. “Sports Hall” murals, Durack State School. 2-day mural workshops, Millmerran Sports Centre & Cecil Plains Skate Park (Funded by Toowoomba Regional Council). “Tank Mission” piece, Tweed Valley. “Redlands Canteen” murals for Redlands Softball Club, Ormiston. 2-day mural workshops for the Millmerran Historical Society (Funded by RADF). 3 design workshops with Grand Avenue & Reichlands East State School (Funded by John Holand & co-facilitated by The Horizon Alliance). “Teach the Teachers” aerosol art workshop with 12 teachers, Logan Art Gallery. 9 day project to facilitate workshops to complete banners with the Blackall Pony Club, visitor information signs, canvasses & demonstrations at the Blackall Show (Funded by RADF). “The Manor” canvas commissioned by private collector. Backyard mural at private residence, Redlands. Finalist in Sheffield International Mural Fest, Tasmania. Participant in Wreckers Yard Aerosol art competition sponsored by Red Bull. Youth week workshops in Eidsvold and Monto (Funded by Rural Youth Service). 4 Richlands station wall design workshops with Brisbane Youth Detention Centre, Inala PCYC & Glenala SHS (Funded by John Holand & co-facilitated by The Horizon Alliance). Launch of new Aerograffix website built by Roundhouse. Block J mural, Mt Cotton State School. 4 workshops to complete “Synergy” mural, Eagleby (Supported by YACCA & Funded by Wesley Mission). 4-day art project with Longreach Student Hostel (Funded by RADF & supported by Longreach Regional Council). 5 Richlands station wall design workshops with Brisbane Youth Detention Centre, Inala PCYC & Glenala SHS (Funded & co-facilitated by The Horizon Alliance). 3-day mural project Gladstone (Funded by GAGAL). Workshop to complete small mural with SWAG (Students With A Goal) Nambour. 2-weeks in Thailand & completion of several sketches & works on canvas. Completed final info and images for website finishing touches. “Drag On Inn” tuckshop mural, Durack State School (Funded by P&C). Block C mural, Mt Cotton State School. “The Distributors” boardroom mural, Brisbane. 3- day “Bluelight” mural project Blackall, (Funded by Blackall-Tambo Regional Council). “Duthie Park” frog canvas for private collector, Blackall. “Skeleton” car commissioned for gift, Sunshine Coast. 2-day “Ever Upwards” mural project, Mundubbera State School. Interior murals, Mooshka Bar and Restaurant, Sunshine Beach. 5 workshops to complete “Engage, Relate Participate” mural, Mt Gravatt West Special School. Join up pieces with Skon & Some, Kapow Entertainment Logan Hyperdome. 6-day project to complete Technology, Wall of Fame & School sign murals, Blackall State School. “Kristen” canvas commissioned for private collector, Newtown Queensland. Mural at Millmerran skate park (Funded by Toowoomba Regional Council). Workshop at “Colab Heads” BBQ, Logan. (Funded by Kingston East Neighbourhood Centre). “School Rulez” mural, Durack State School. Exhibition of works on canvas, Lakeside “lifestyle” festival, Victoria Point. “Indy Track” mural, Kingston Park Raceway. 2 stenciling workshops, Capalaba State College. Mural collaboration with David Riley, Acacia Ridge Community Festival (Funded by Inala Youth Service). 4-day mural art project, Blackall State School. “Formal Garden” mural, Blackall Residential Care (Funded by Blackall/Tambo Regional Council). Completion of murals, Thornlands Dam overflow (Funded by Redland City Council). 5 workshops to complete “Youth Van” mural (Funded by Logan City Council). “Caution” office door mural, Redlands PCYC. 3 canvas painting workshops with Centre Education Program (Funded by Youth and Family Services). “Bike Education Centre” sign, Bayside PCYC. 10-day workshops and demonstrations at Rockhampton and Yeppoon for “The Village Festival” (Funded by the Keppel Coast Arts Council/RADF). 4-day Aerosol Art Project, Monto (Funded by RADF and Rural Youth Service). 2 workshops, CANTEEN Winter Camp Tallabudgera. After School Hours Care mural, Mt Gravatt State School (Funded by Mt Gravatt PCYC). Guest presentation to class at Mt Gravatt State School. Mural at private residence, Cairns. 3 workshops to complete “Dropping In” mural at “Shockwave Youth Arts Festival” Blackall (Funded by By Blackall-Tambo Regional Council). “RIZE” promo board, Community Connect Trust Browns Plains. “Battle of the Bands” mural, Derby cars and demos Cloncurry Show (Funded by PCYC). Commissioned mural at private residence, Wakerly. Workshop to complete “4300” mural Carole Park Come Together Festival (Funded by Inala Youth Service). Guest presentation to year 12 class, Redlands College. “Mooshka” Restaurant logo design and mural, Sunshine Beach. 3 workshops to complete the “Workshop” mural at Moorooka Day Service (funded by Cerebral Palsy League Queensland). 3 workshops at Thornlands skatepark (funded by Redland City Council). 6 day Heartland Festival arts project to complete banners, Blackall State School and “past and Future” murals (Funded by Blackall-Tambo Regional Council). Canvasses exhibited at Blackall Cultural Association Art Show. Canvas commissioned for Acacia Motel Foyer, Blackall. 3-day “Up2scratch” workshops, Cloncurry PCYC (Funded by Cloncurry Shire Council). Workshop Longreach State High School & Youth Week artwork (Funded by Anglicare Central Queensland & Longreach Shire council). Guest presentation at Capalaba State College senior arts forum. 3 workshops to complete Get Set For Works murals at Redlands PCYC (Funded by Boystown Redlands & Redlands PCYC). 6 workshops to complete 2 murals at Bundamba State Secondary College (Funded By Ipswich Community Youth Service). “Trebs” canvas commissioned by private collector. “Soccer Goalie” mural, Upper Mt Gravatt State School. 60m long bush scene mural, Tadpoles Early Learning Centre Narangba. 3 workshops to complete canvas at Moorooka Day Service (funded by Cerebral Palsy League Queensland). School sign mural, Upper Mount Gravatt State School. “Chris’s” snowboard commissioned for private collector. “Learn to swim” mural, Bayside PCYC. “The Wiz” school play props mural, Cantebury College. Mural at private residence, Wellington Point. 100m long animal themed mural, Tadpoles Early Learning Centre Sunshine Beach. “Values” mural & ball court piece at Springwood Road State School. Rogue fairy cut out on board completed for private collector. 3 murals, The Gap SHS Peer support program (Funded by Community Connections and The Gap SHS). 3 workshops to complete “Rage” mural, Carindale PCYC. “The process” mural, Mt Gravatt SS. 5-day arts project, Yuendumu NT. 7D & 7E murals, Upper Mt Gravatt SS. 1 workshop to complete Capalaba Warriors Rugby murals with the Get Set For Work program, Boystown Redlands. New pieces at Diamonds Furniture, Newmarket. Shopfront & trailer murals DiveXcite, Stafford. Takeaway sign, Happy Hippo Capalaba. 2 workshops to complete mural, St Augustines Catholic College. Cultural mural & Penguin murals, Upper Mt Gravatt SS. 3 workshops Get Set For Work program, Boystown Redlands. Guest book, Living Library Victoria Point. XR6 ute mural, Planet Matterz, Morningside. Welcome & skipping murals, Pallara SS. Eagleby Youth Space van murals. Visual arts workshop at Party in the park, Accacia Ridge (Funded by Inala Youth Service). 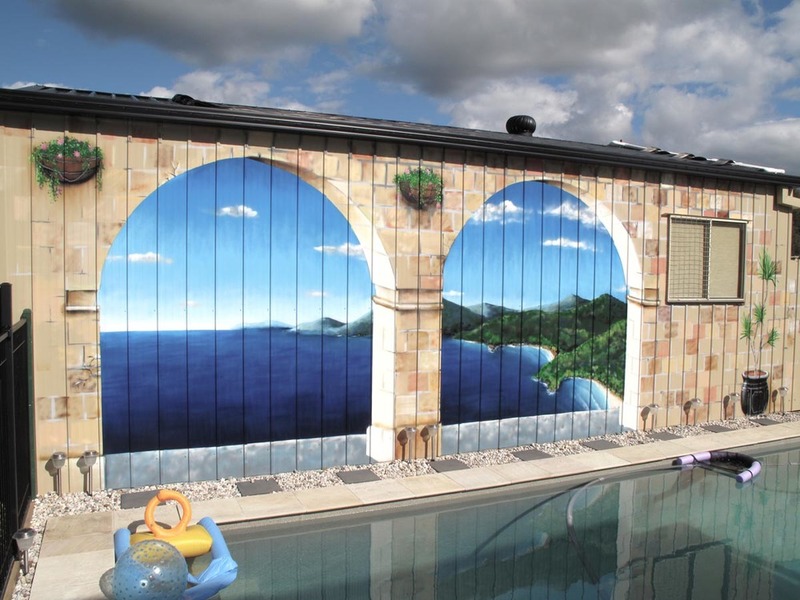 Poolside seascape mural at private residence Wellington Point. Entrance mural at Bayside PCYC, Lota. Happy Hippo shopfront mural, Capalaba. Ball wall mural, Upper Mt Gravatt SS. XR6 sedan mural, Planet Matterz, Morningside. 4 workshops to complete Get Set For Work mural at Capalaba Warriors Junior Rugby League Club (Funded by Boystown Redlands & Capalaba Warriors). 3 workshops to complete “Strive to Excel” mural at Upper Mt Gravatt SS. 5 workshops to complete backdrop mural for performance at Jugglers Artspace Fortitude Valley. Workshop at Picabeen Community Centre, Michelton. Workshop at “Sports in the hood” Inala PCYC. Murals at Kenmore Rugby club. 3 workshops to complete murals on Coast Connections minibus. “Marumba” (good place) mural at Palarra SS. Pool ceiling mural, Bayside PCYC. 3 workshops to complete mural, ONE-80 program Mt Gravatt East SS. Design “Pop n lock fashions” logo. 1st, 2nd and best letter form winner King of Canvas aerosol art competition (Funded by the city of Onkaparinga). Lest We Forget ANZAC mural at Upper Mt Gravatt SS. Mad Hatter mural, Four Square convenience store Cannon Hill. DJ for Rob D, OSEVEN & Acizm sets, Jubilee Hotel (Supported by Soul Concert Records). DJ set, up2scratch workshop & management of Hip Hop tent, Bay Wave Festival (Funded by BABI Youth & Family Support & Port of Brisbane Corp). Space Funk mural at Coolnwynpin creek underpass (Supported by Main roads). Doggy Day Care mural, Paddington. Demo, Logan Youth Week event (carried out by Skon & funded by Logan PCYC). 2 workshops to complete mural for SMART program, Eagleby Youth Space. Demo Redlands Youth Week event (Carried out by Tom Thumb & funded by The Scout Association of Australia, QLD Branch). 4 day project to complete workshops and murals, Blackall & Longreach (Funded by Anglicare Central Queensland). 2 day project to complete workshops and murals, Cloncurry (Funded by Cloncurry PCYC, Cloncurry Shire Council & workforce Solutions). Workshop for Inala Wangarra Youth Week event, Inala (Facilitated by Skon, funded by Inala Youth Service & YACCA). Mural at Graffic Beat, Wooloongabba. Large mural at Logan Women`s Health & Wellbeing Centre, Kingston. Designed entered to “The Great Wall of Triple j” competition. Completion of “Cool lake” canvas. 2 workshops for SMART program, Eagleby Youth Space. OSEVEN logo design for Handmade Productions. Mural at private residence, Brisbane. Workshops & murals, Redlands Disability Services Inc, Alexandra Hills (Funded By Regional Arts Development Fund). Workshop for SMART Program, Eagleby Youth Space. 4 Murals, Cleveland (Funded by Redland Shire Council). Van murals for Tusque clothing. 3 nature and 1 sports mural, Mt Cotton SS. DJ for “Extended Play” set at Uber, West End (Supported by Nurcha Records). 4-day project to complete mural on skate ramp wall, vehicle and 40 X canvasses for Sunfest (funded by Calliope & Gladstone City Councils). Workshop at Sports In The Hood, Inala PCYC (Funded by Inala Youth Service). Mural, Redlands Softball Club, Ormiston. 4 interior murals, IN-SYNC Youth & Family Support (Funded by Spiritus). Welcome, fairy garden & sports murals at Nobby SS. Demo Redlands Youth Plaza (Funded by Plan C). Spin Room mural, Ashmore PCYC. Commission of 13X skateboard decks (Funded by Redland Shire Council). Brush workshop, Carole Park (Funded by Inala Youth service). Mural at private residence, Nobby QLD. T-shirt design for “Oseven” clothing. Block R mural, Mt Cotton State School. Nature mural, Thornlands (Funded by Redland Shire Council). Aerosol art workshop, The Spot Browns Plains (made possible by Elements hip hop workshops). Demostration/commission of 2 boards at special event, Arts Precinct Wellington Point (Funded by Bayside Disability Services). Undercover play area mural at Coolnwynpin SS, Capalaba. Canvas painting demo at The Rumpus Room, West End. Canvas painting workshop at “Party on in the park” Accacia Ridge (Funded by Accacia Ridge Community Centre). Shop front mural, Planet Matterz Morningside. 2 Murals, Nobby State School. Entrance mural at Coolnwynpin State School, Capalaba. Prop design for “In Concert” play production. 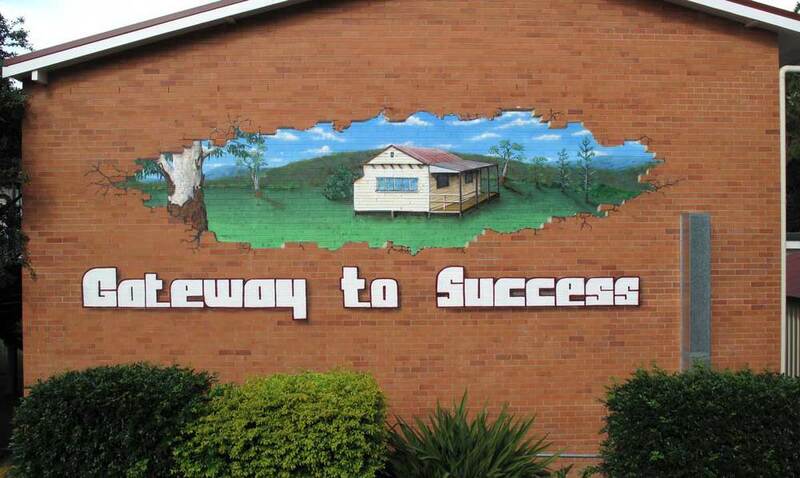 Mural & signage, Mt Cotton State School. Mural at Wellington Point SHS. 2 workshops to complete mural at Wynnum North SHS (Part funded by BABI). Workshop at “Sports in tha hood”, Inala PCYC (Funded by Inala Youth Service). 2 murals, Planet Matterz Morningside. T-shirt design for “Phat Kidz” clothing. 3 workshops to complete 2 murals, Thornlands (Funded by Redland Shire Council). Canvas painting workshop, Mt Gravatt PCYC. 3 DJ & MC workshops, St Josephs College Toowoomba. Mural and demo Redlands District Committee On The Ageing. DJ & MC workshops Narrabri & Wee Wah, NSW. 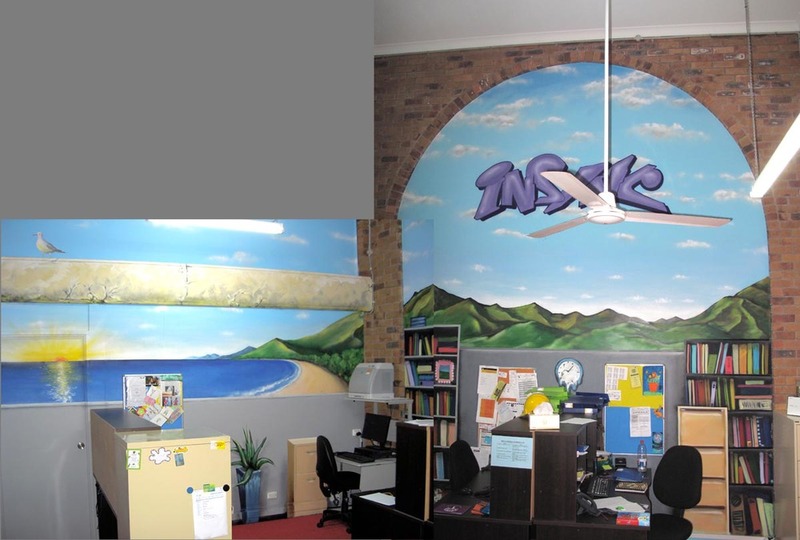 2 mural painting workshops with Albert Park Flexischool. Dining room feature mural, Private residence Collingwood Park. 2 sessions to begin mural, St Johns Indropilly (Funded by SPIRITUS & Bris North Youth Justice). “Scrambler” amusement ride mural, Kingston Park Raceway. “Gee Wizz” amusement ride mural, Kingston Park Raceway. Album cover artwork for Rob D “Lifes Lessons”. Several murals at Positive Learning Centre, Keperra. Management of Hip Hop tent, Bay Wave festival, Lota (Funded by BABI). Supporting sponsor of Australia wide “Freshest Sketch” competition. Skateboard deck & T-Shirt designs for “Carrot Skateboards” Serbia. Canvas painting workshop (Funded by Brisbane North Youth Justice Service). Arts workshop (Funded by PCYC Mt Gravatt). DJ workshop (Funded by SWAG) Nambour. Aerosol workshop, Lennox Head (Funded by Ballina Shire Council). 3-day skatepark & canvas workshops, (Funded by Narrabri Youth Services). 2 day stenciling workshop to complete mural (Funded by Narrabri State School). Mural at private residence, Lismore NSW. Mural at Durack Guide hall, Inala skatepark. 2 watercolour pencil drawings, private collector Northern NSW. Aerosol on canvas kiddie portrait commissioned by private collector Gold Coast. 50m long mural, Crazy Clarks Nambour. 2-day youth arts project, Wynnum North High School (Funded by BABI). MC+DJ workshop, Wynnum North High School. Luggage trailer mural for DIVE X SITE, Stafford. Several workshops during 4 day arts project, Longreach CQ, (Funded by Anglicare CQ). DJ performance for “Fashion Vs Fashion” parade and launch at UBER, West End (Funded by Brisbane City Council). 11 canvasses sold to USA collector to be distributed through a Paris gallery. T-shirt design for Gangsta Graffix, Gold Coast. Launch of new Aerograffix website. 3 workshops to complete murals at Grovely pool complex (Funded by Picabeen Community Centre). Workshop at Thornlands skatepark (Funded by Redland Shire Council). DJ performance and workshop for project completion celebration (Funded by Picabeen Community centre). 5 workshops to complete Lizards Childcare mural project (Funded by Lizards and DOC). Mural at Glenala High Tuckshop. (Funded by P&C). 2 workshops, Picabeen Community Centre, Michelton. Canvas featured in “X” group exhibition, RED Gallery Fortitude Valley. 3 workshops to complete 2 murals, Lizards Early Learning Centre Aspley(Funded by Lizards and Dept of Communities). Mural at Jugglers artspace, Fortitude Valley. Stenciling workshop, Woodcrest college. (Funded By Ipswich Community Youth Service). 3 workshops to begin 2 murals, Lizards Early Learning Centre Aspley (Funded by Lizards and Dept of Communities). Workshop, Picabeen Community Centre, Michelton. Canvas commissioned to private collector, Brisbane. 8 days of workshops to complete 12 murals and several canvasses, Mornington Island (Funded by PCYC and Mornington Island State School). Mural for Lifeline on Ann, Fortitude Valley. Workshop to complete mural, Picabeen Community Centre, Michelton. Mural at Presbyterian Church, Victoria Point. 3 workshops to complete mural with students from SWAG, Nambour (Funded by IFYS). 2-day project to complete several murals, Chinchilla QLD. Canvas painting workshop, Spring Festival, Cleveland. 4 workshops to complete murals, Alexandra Hills (funded by Boystown & Bayside Gate Employment). Mural at Planet Matterz Cooparoo. 5 murals over 4 days of workshops, Longreach (Funded by Anglicare CQ and Gaming Machine Community Benefit Fund). Canvas painting, beatboxing, rhyme & recording workshops, Wynnum PCYC. 6 day contract as Acting Youth Development Officer, Redland Shire Council. Massive trackside mural, Wynnum (funded by Aerograffix artists, Dept of Communities and Bay Central Storage). 7 murals for Metro Netball Club, Cooparoo. Canvas painting and stenciling workshop, Mount Gravatt PCYC. 13 day contract as Acting Youth Development Officer, Redland Shire Council. Commission of “Charlies Garage” canvas, Manly. Carry out mural, Chermside (Funded by Brisbane North Youth Justice, Dept of Communities). 12 small murals and 1 large wall mural. Durack State School. Promo artwork for “Flowrider” launch, Dreamworld, Gold Coast. Foyer mural for Animal Management, Ipswich City Council. 4 days of workshops to complete murals at “VERB YOUTH LOUNGE”, Yeppoon (Funded by Livingstone Shire Council). 4 workshops + 1 mural, Gold Coast City Council/ YARA project (funded by Graffiti Solutions). Murals at Wynnum High and Wynnum PCYC, BABI Graffiti Project (funded by Graffiti Solutions). T-Shirt Screenprinting for New Edition Skateboards. Mural at “Flavours of Punjab” resturaunt, Wynnum. 4 workshops, Gold Coast City Council/ YARA project (funded by Graffiti Solutions). Mural at Beenleigh Marketplace shopping centre, Mercury Project. Demo and sale of canvas, Youth Day Out, Cleveland (Funded by Rotary and RSC). Mural at Camira State School. 3 murals at Redlands Softball clubhouse. 2 workshops, Mercury project, Eagleby. 3 workshops, murals at Wynnum North Scout Den, Wynnum High, BABI Graffiti Project (funded by Graffiti Solutions). Facilitated 4 sessions of “Mercury” project (Hip Hop theory and arts practical), Beenleigh. Cover artwork and logo design for Brisbane Hip Hop group “2LAIDBACK”. Additional murals at Musgrave, Newmarket and Acacia Ridge pools. 2 workshops at BABI Wynnum, (funded by Graffiti Solutions). 2 murals at Brisbane Childrens Court. Mural at Victoria Point soundshed. 8 canvasses commissioned/sold to art collector in USA. 2 week Capalaba Bus interchange mural (funded by Redland Shire Council and property owner). Mural commissioned at private residence, Cairns. 2 workshops to complete dog pound mural, Ipswich (Funded by Ipswich City Council and Ipswich Community Youth Service). 3 day mural project to complete “Drag-on Inn” tuckshop mural, Durack State School. Arts demo at “Party in the Park”, Acacia Ridge (Funded by Acacia Ridge and Districts Community Centre). Mural at Yeronga pool (Funfed by Brisbane City Council). Mural at Newmarket pool (Funded by Brisbane City Council). Demo at opening of Arts Precinct, Wellington Pt (Funded by Redlands Disability Services Inc). 2 murals, Michelton State High School (Part funded by Picabeen Community Org). 5 boards and 1 mural commissioned by Mt Gravatt State School. 4 workshops to complete 1st stage of murals, Brisbane Childrens Court (Funded by Brisbane North Youth Justice Service). T-shirt designs and screenprinting by Mystik & Jaybe. Mural at weighstation, Cunningham Highway, Ipswich (Funded by Main Roads and ICYS). 2 workshops to complete “Special Ed” mural, Coolwynpin State School. DJ set “Graffic” exhibition, Jugglers Artspace Fortitude Valley. Sale of canvas to private collector. Mural at Mt Gravatt State School. 2-day mural workshops, Our Lady’s School Longreach (Funded by PCAP and Our Lady’s). Completion of facilitating 12-week “GRAFFIC” arts project, Jugglers artspace Fortitude Valley (Funded by QLD Gov. Community Benefit Fund). 2 murals, Wellington Point Arts Precinct (Funded by Redlands Disability Services Inc). Large murals at Wynnum & Bayside Childcare Centre. Commission of artwork for Redlands Fellowship Community Church. Murals on feature walls in private residence, Ormeau Gold Coast. Mural workshop, Ipswich Community Youth Service. 3 workshops to complete “Reconciliation” mural, Hendra Secondary College. Large murals , Cleveland Indoor Pool Complex (Funded by Redland Shire Council). 1 mural workshop, Wynnum PCYC. Canvas painting and stencil workshop (Funded by QPASTT). Mural at YMCA Acaccia Ridge (Funded by Inala Youth And Family Support). Several murals and workshops, Longreach, Blackall and Barcaldine Central QLD (Funded by OPAC and Anglicare). 2 murals and 40 canvasses over 6 workshops, Shoalhaven Youth Works Conference Centre, Nowra NSW (Funded by the Junction Youth Centre Austral NSW). 5 day Robina Underpass mural project, Gold Coast (Funded by Gold Coast City Council and Robina Land Corperation). 4 day Pizzey Park Softball Club mural (Funded by Gold Coast City Council). Rock Estedeford prop artwork, Carole Park State School. Workshop at Robina State School (Funded by Gold Coast City Council). 3 workshops to complete girls toilet mural with students at Hendra Secondary College, Clayfield. 3 workshops with Varsity College, Robina Primary, Robina High and Miami Primary schools (Funded by Gold Coast City Council). Mural on transformer box at Beenleigh Library (Funded by Gold Coast City Council). Workshop at “Fresh Start” special schooling provider, Wynnum. 2-day workshop and mural painting project at Aramac, Central West QLD (Funded by RADF, PCAP and CAYIS). Mural at Wynnum West Shops (Funded by Oxford Crest Management). Completion of 16 month “Communik8” support program as facilitator. For young repeat offenders. (Funded by BABI Youth and Family Support). Carried out Djing at 40th private party. Large murals, Ormiston Underpass mural project (Funded by Redland Shire Council). DJ Set, Wynnum Youth Voice celebration. (Funded by Brisbane City Council). 5 workshops including 2 murals, Moura (Funded by RADF Central QLD). 6 workshops to complete 3 murals, Woodcrest College (Funded by Ipswich Community Youth Service). 6 boards commissioned by Denman st Youth and Ed Centre. 3 workshops to complete mural with students at Hendra Secondary College, Clayfield. Signage for BABI Youth and family Support, Wynnum. 3 sessions to carry out war mural, Chermside (Funded by Dept of Communities). 2 Workshops at RE:Create Arana Hills (Funded by Brisbane City Council). 3 workshops including completion of mural at Cooparoo Secondary College (Funded by the Get Set For Work Program). Large wall mural, Mount Gravatt (Funded by Mt Gravatt State School). 3 workshops to complete a mural, Sunnybank (Funded by Contact Inc). 3 workshops at RE:Create Arana Hills (Funded by Brisbane City Council). 2 Workshops at Picabeen Community Centre, Michelton. 7 Murals and 1 sign at Carole Park State School. DJ set and coordination of Hip Hop tent at “Youth Injected” Lota skate park (Funded by Brisbane City Council). Workshop at “Brainwave” festival Zillmere (Funded by QLD Health). Canvas painting workshop, PCYC Mt Gravatt. Workshop at RE:Create Arana Hills (Funded by Brisbane City Council). 2 workshops including 4 murals at Ipswich Youth and Family Support, Ipswich. Demo and sale of artworks at “Youth Day Out”, Victoria Point (Funded by Rotary Club of Redlands Sunrise). Wellington Point underpass mural project (Funded by Redland Shire Council). Workshop at Inala skatepark opening (Funded by Brisbane City Council). Facilitate mural competition information session (Funded by Gold Coast City Council). 4 Hip Hop workshops with COOEE, Capalaba. Including Djing and aerosol art. 2 workshops for “Re:Create” project, Carole park including a mural (Funded by Brisbane City Council). Mural at Carole Park State School. 5 workshops at Picabeen Community Centre and 1 mural at Mitchelton State High School. 2 workshops including a mural at ESP Ipswich Community Youth Service Inc.
Mural at Carole Park Pool for Chillout. 3 workshops at Picabeen Community Centre and 1 mural at Michelton State High School. 4 workshops for “Re-Create” project, Carole park (Funded by Brisbane City Council). 4 workshops at Picabeen Community Centre. Inclusion in Queensland Arts Councils ontour Directory. Mural at Redlands Softball Club, Ormiston. Bloomfield St underpass 3 day mural project, Celeveland (Funded by Redland Shire Council). 2 workshops at IN-SYNC, Cleveland (Funded by RADF). Demo at event for Redlands Training Catalyst (Funded by Redland Shire Council). Workshop at Visible Ink, Zillemere for “Chill Out” holiday program. “Raw Metal” tap dance company promo board for Capalaba Central Shopping Centre. 2 workshops at Speakout, City. 2 Workshops and murals at The Spot, Browns Plains. 1 Workshop, Eagleby Youth Space (Funded by Beenleigh Area Youth Service). Promo artwork for “PetrolHeads” merchandise company.